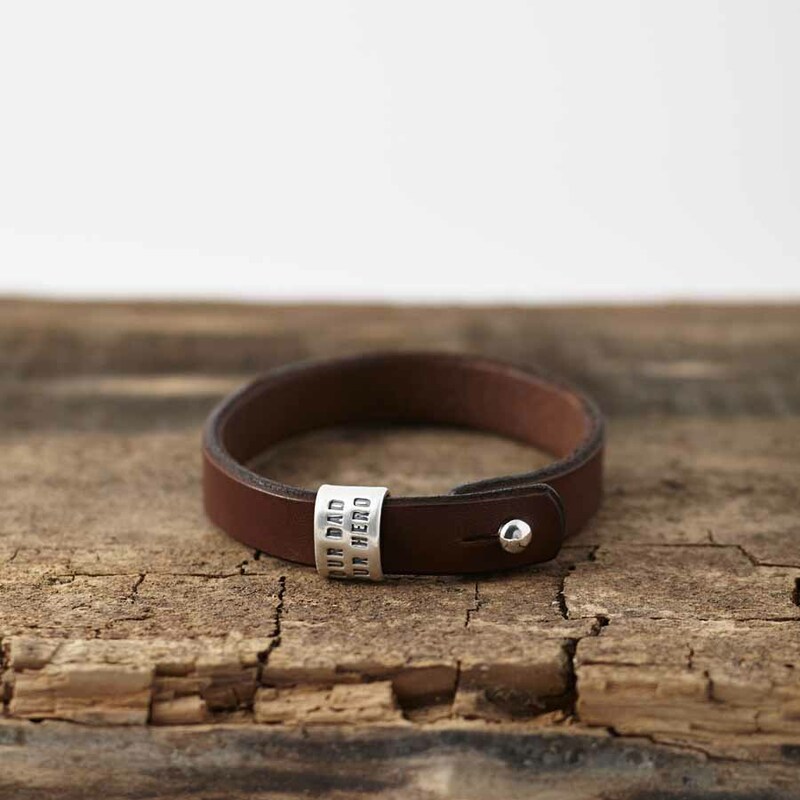 Rugged, minimalist leather bracelet featuring hand-crafted solid silver links that can be personalised with your choice of text. A fantastic gift: include a message, coordinates of a special place, names, dates of birth, the choice is yours. This masculine silver and leather bracelet with a simple Sam Browne stud closure is a perfect accent for his wrist. A great choice for men who don’t usually wear jewellery as this bracelet is very like wearing a watch. We carefully cut, bevel, dye and burnish the edges of the leather in our workshop using traditional tools, finishing this process with a coat of beeswax to give them a beautiful, professional smooth finish. One link is included in the price above, additional links can be purchased using the menu. Additional links can also be purchased at a later date to add to the bracelet. We can stamp up to 15 characters (including spaces and punctuation) per line, two lines per link, therefore 30 characters in total per link. Please note that due to the design, if you choose more than seven characters per line, some of the text will be on the inside of the bracelet. Available in either brown or black leather: please use the menu below to select your colour choice. The bracelet will fit a wrist of up to 21cm, but because we make these by hand, we can make them to any length.